Lismore Regional Gallery has received two gongs at the 2018 NSW Country Division Architecture Awards announced last night. The Australian Institute of Architects named the new gallery winner of the heritage category while also awarding a commendation for public architecture. The gallery was designed by Bangalow-based firm Dominic Finlay Jones Architects, which also designed major refurbishments to Lismore City Hall. The project sought to repurpose Lismore High School’s dilapidated former ‘C-Block’ with a focus on reusing as much of the original building as possible and retaining the precinct’s character. The building and grounds occupy a key position within a cluster of historic brick buildings in the heart of Lismore, also housing the Lismore Library and Northern Rivers Conservatorium. 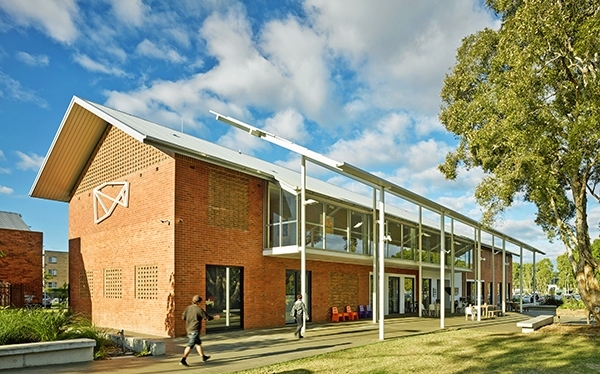 “While not of the same architectural significance as its listed neighbours, C-Block’s retention freed up the budget to include the adjoining Quadrangle in its scope, creating over half an acre of public landscaped greenspace for the people of Lismore,” Gallery Director Brett Adlington said. “The team from Dominic Finlay Jones Architects sought to create a contemporary 21st century space while working in sympathy with the heritage precinct. In providing a state-of-the-art facility, the architects cleverly retained the atmosphere of the old school building which many visitors have fond memories of attending. “The result is a beautiful central community space in the centre of our city that has become a focal point for art, music and community gatherings of all kinds. Image: New gallery by Christopher Frederick Jones courtesy of the Australian Institute of Architects.